Submersible Low Range waste water level transmitter with intrinsically safe option for monitoring the level of sewage and effluent in water treatment plants. The LMK382 waste water level sensor has a stainless steel housing and a flush ceramic diaphragm which prevents clogging and facilitates cleaning. Available in level ranges from 0.4 up to 100 meters of water gauge. Monitoring fuel level in daily tanks of gensets with fuel temperature up to 85 °C. What are the lower limits of the range for this product? I need a sensor that can detect changes in water depth in fractions of an inch. Can this sensor be used for a range of 0 to 4 inches? The lowest range is 0 to 16 inches, so although it you only be using 25% of the range, you will be able to detect changes in fractions of an inch. Is the 125 degC rated TPE cable suitable to use in landfill applications? Yes you can use the TPE coated submersible sensor cable on installations where the cable will be in contact with landfill leachate. Do you provide a display that will interface with the LMK 382 level transmitter? We would suggest the PA440, SRP94 or SRP-N118 display indicators, and the choice will depending on how you wish to mount indicator and what other features you need such as alarm trips and analogue output. What is the bend radius of the cable that will need to be maintained? For static installation use the 10-fold cable diameter, for dynamic applications use the 20-fold diameter. My application requires a device that can be lowered into a pool that will increase in temperature to 212F? The maximum allowed temperature for the LMK 382 is 257F with the TPE cable option. The probe will be lowered into a pool down to a depth of 15ft, will the weight be too much? There will be no noticeable effect on performance when installing ot a depth of 15 feet. 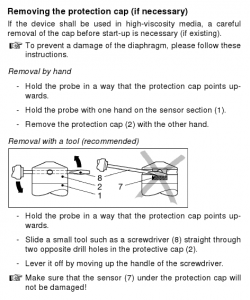 Is the submersible cone on the LMK382 removable and will it have a deleterious effect if removed? Yes, if you remove the nose cone carefully as described in the operating manual it will not cause any harm or damage ot the sensor. However an exposed flush diaphragm will be vulnerable to mechanical damage so we only recommend removing just before installing. Is it possible to make an absolute version of the LMK382 submersible waste water pressure transmitter? Yes, although it is not mentioned on the data sheet currently, it is possible to provide absolute ranges as a custom option from 1 bar up to the maximum range of 10 bar absolute. 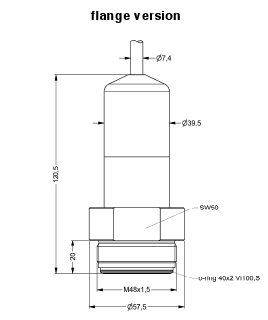 Is it possible for the threaded flange mount version of the LMK382 flush level transmitter to be provided with a tapered thread on the outside of the transmitter, instead of the standard parallel thread? Sorry no, not for the LMK382, generally it is not possible to use tapered threads with an exposed flush sensing diaphragm due to the close proximity of mechanical stresses generated by tightening this type of thread. The induced stresses on the diaphragm can affect calibration settings, particularly with low pressure ranges, and in worst cases cause the sensing diaphragm to fail. We would like to use the LMK382 waste water hydrostatic level transmitter for measuring the amount of sludge inside a storage tank. We intend to install it using the flange version, but can the sensor be supplied with a flange or do we have to find a separate supplier for this? 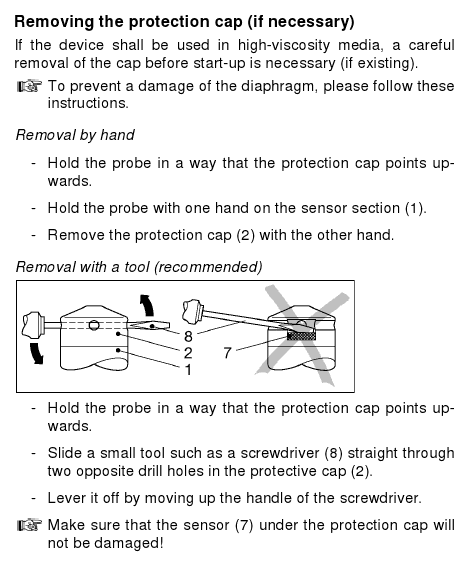 The flange can supplied as a separate item for screwing onto the LMK382 sensor, you can choose from 3 different flanges: DN25, DN50 or DN80, as described in the table below. 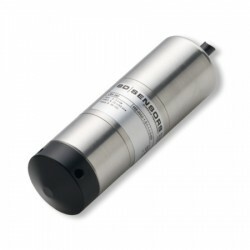 I’m looking for a submersible water level sensor which will operate in water temperatures of 150 degrees Fahrenheit, and measure over 0 to 2 ft? Since the temperature is close to the maximum limit for PUR and PVC cable, we would recommend the TPE cable option which is suitable for water temperatures up to 257 degrees Fahrenheit. Also the LMK 382 can be custom scaled to a range of 0 to 2 feet of water column. 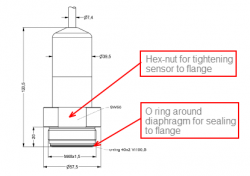 The LMK382 wastewater pressure transmitter technical datasheet appears to show a parallel thread that screws into a flange with a tapped hole and a back-nut to lock the sensor in place. Please could you clarify if this is how the two parts are joined together? 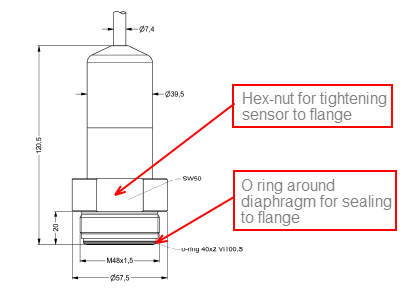 Please see the sketches below which show how the sensor is mounted onto the flange, it seals on the front O ring, and the fixed back-nut is for tightening the sensor onto the flange. 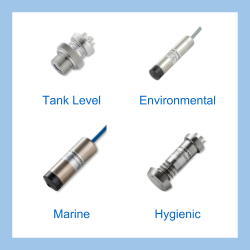 The LMK382 low range submersible level sensor product page suggests that the sensor is for installing in water, so I was wondering whether it will need any additional certification to operate in diesel and will it affect the service life of the sensor? Additional certification is only required if the area that it is being installed is classified as a hazardous area (potentially explosive). The normal service life will not be affected by immersion in Diesel. Can the LMK382 be used with grubby rain water? Yes, this sensor has a flush diaphragm under the nose cone so it can be installed with or without the nose cone, and easily cleaned either way if it becomes clogged. Please select the options you require for the LMK382 Low Range IP68 Waste Water Level Transmitter in your application and request a quote. Send us your enquiry for LMK382 Low Range IP68 Waste Water Level Transmitter to get assistance with this product type.